Not everyone is as up-to-speed with Word 2016 as you are. Some folks still use Word 2002, Word 98, and even Word 97. You can’t change anyone’s mind about software upgrade choices, but you can maintain compatibility with individuals or organizations that cling to those older versions of Word. On the Info screen, click the Check for Issues button and choose Check Compatibility. The Microsoft Word Compatibility Checker dialog box appears, similar to what’s shown. It lists any issues your document may have for users of an older version of Word. For example, features such as special text attributes, content controls, or document add-ins would be incompatible with those users’ software. The Compatibility Checker dialog box. Choose which versions of Word to check. Use the Select Versions to Show drop-down menu to select specific Word versions. For example, the content controls are unavailable to Word versions 97 through 2003. The text effects attribute is available in Word 2010 but not in Word 2007. Click the OK button when you’re done checking the document. 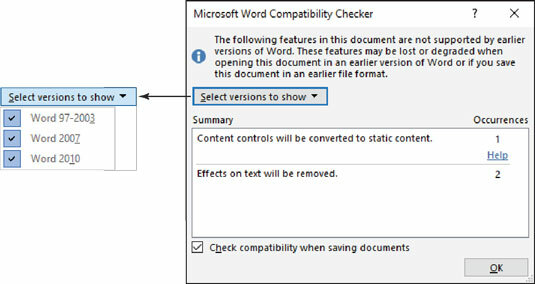 The compatibility checker doesn’t show you specifically where the items are located in the document. That’s really not an issue: The point is whether or not you save the document by using an older file format. When you do, the items listed in the dialog box are lost to that version, typically converted to plain text. If you place a check mark by the item at the bottom of the dialog box, Word displays the Microsoft Word Compatibility Checker dialog box when you attempt to use an older Word file format to save the document. At that point, you can click the Cancel button to stop the save or click Continue to save the document with translated features.